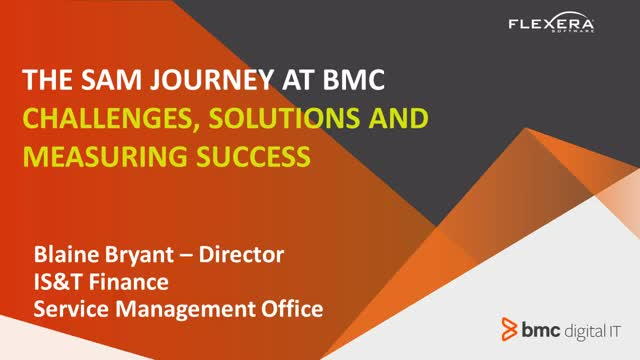 Learn about the Software Asset Management journey at BMC and the management challenges they faced internally, the solution they chose to meet those challenges, how they measure the success of their SAM program, and lessons learned along the way. This webinar addresses commonly asked questions for those starting their Win10 migration including examples of how early adopters have handled their migration. Attend this webinar to learn how to manage and optimize Microsoft Office 365 subscriptions and Client Access Licenses (CALs). As organizations continue to move to the cloud, flexible subscription contract support is critical. In this webinar, Adam Dennison, SVP/Publisher, reviews insights from the new State of the CIO 2016 survey, and discusses top trends in investments, innovation and operational efficiencies that CIOs are prioritizing for the year. Join Steven Thomas, Senior Consultant at Microsoft, specializing in Desktop and Application Virtualization as he talks with Flexera Software about best practices and developments with App V, as well as the future of application virtualization. Join Tim Davis and Mike O'Connor as they share the top 12 reasons why customers have upgraded to the latest version of AdminStudio Suite and the benefits they are realizing to date. In this one hour webinar, we'll introduce the latest product enhancements to App Portal, including the new App Broker for ServiceNow that provides automation and governance over the software request process. Watch this webinar to learn 10 tips and tricks to simplify your Windows 10 migration including reducing the number of applications to migrate, knowing which applications have compatibility issues, and empowering users to migrate when they are ready. Learn about the Software Asset Management processes and tools required to manage your Office 365 subscription to ensure that you are able to control costs and maintain license compliance. This webinar demonstrates what's new in AdminStudio 2016. Learn how to mature your Unified Application Readiness process with increased automation and the ability to prepare reliable Mac and Windows applications for predictable delivery to employee devices. This webinar demonstrates what's new in the latest versions of AdminStudio Suite and Workflow Manager. Learn how your Unified Application Readiness process with incrased automation and the ability to prepare reliable Mac and Windows applications for predictable delivery to employee devices. In this webinar, Robert Young, IDC analyst, shares insights and findings from his latest research report. Along with Steve Schmidt, VP of Flexera Software, they will discuss reducing risk and improving productivity of managing software assets across devices. Learn how software license optimization empowers IT Procurement, Sourcing, and Vendor Management to control costs for software licenses and cloud services, and negotiate better agreements. Attend this webinar to hear how to translate legislative requirements into an action plan for compliance and to gain an understanding of the software asset management processes and tools required to meet the mandates. Learn how to manage and optimize licensing for desktop environments to maintain license compliance/reduce audit risk, maximize utilization of assets, and control costs. Despite the awareness that patching plays an important role in every organizations security, we continue to see incidents in which software vulnerabilities are a root cause, or enabler of security breaches. We believe that a different perspective to patch management is the key to prioritize patching, reducing work load and improving the security baseline for organizations. This webinar is for those in charge of scoping, supporting and executing patch management strategies. We talk about patch management in the context of security and will show how our solution, Corporate Software Inspector, can help organizations extend the scope of their Microsoft System Center implementation to prioritize patching of non-Microsoft applications. View this webinar with “R” Wang from Constellation Research, to better understand cloud software licensing and to get tips and tricks for cloud contract negotiations so you can wrap your arms around the cloud. View this Webinar to get an overview of the benefits of integrating IT Service Management and Software License Optimization solutions to drive efficiency and cost savings. IT Operations Professionals face a range of challenges across increasingly complex environments. They need to manage software and complicated licensing terms, and the underlying hardware assets. They must satisfy the needs of end-users while meeting the service levels for desktop and datacenter environments with limited resources. And with increasing use of cloud infrastructure and mobile devices, IT Ops must keep an eye on security while meeting the business requirements of a mobile and global workforce. The IT Operations Insights and Strategies channel from Flexera Software brings you relevant, timely, and focused content that you can use to help manage applications throughout the software lifecycle, optimize spending, and collaborate across silos to maximize your operational efficiency.